​Are you a mom-to-be? Congrats! It can be hard to find workouts that work for your changing body while you're pregnant, but prenatal yoga is always a good choice. 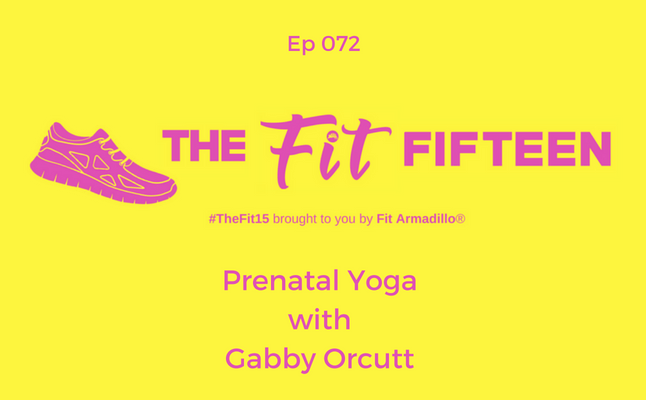 Learn more about prenatal yoga classes, how they are different from regular yoga classes, why they are so good for pregnant moms, and a few great poses to try at home with today's guest, yoga instructor, Gabby Orcutt. digestion and a reduction in anxiety. Eight years later yoga reentered her life after gaining 60 lbs. while pregnant with her second child. She needed to find a workout she loved, it must tone the body and not involve running. Yoga consistently for two years, she went to the closest certification and has been sharing the practice within a three county radius of her home. Falling even deeper in love with yoga and reveling in its benefits, she finished her 200 hour RYT through Buti Yoga in July. It is Gabby’s life mission to lead women on the path to self love and acceptance. To learn to love the body parts she once hated, to drop the lies from body dysmorphia and step into her power to rise up and live in her truth, unapologetically, everyday. This is achieved through Buti Yoga movement, Goddess Coaching mindset, and Boudoir portraits. A landlocked mermaid, Gabby lives in DuBois, PA with her two children, husband and two kitties. She currently teaches at SoL Wellness & Gathering Space in DuBois, PA and Organic Mechanics in St. Marys, PA.